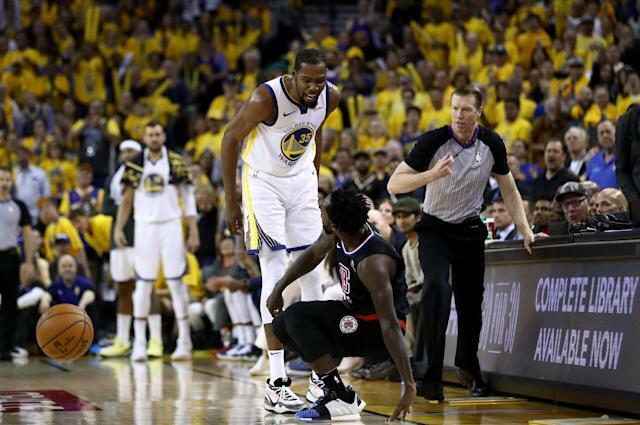 OAKLAND, Calif. — The Los Angeles Clippers lost Game 1 of their first-round playoff series to the Golden State Warriors on Saturday night, but Patrick Beverley successfully duped Kevin Durant into some physical antics that could prove costly for the Warriors this postseason. Beverley and Durant were ejected in the fourth quarter after being hit with double-technical fouls when the 7-foot small forward dug into the guard on defense, shoving him to the floor near half-court and sparking a face-to-face confrontation. "I got pushed. I got up. I got ejected,” Beverley said. “I guess the ref, he saw something that … I don't know. But it's all right." The game was already well in hand for the Warriors as they won 121-104, but now the defending back-to-back champs have another reason to be concerned moving forward. If a player accumulates seven technical fouls during postseason play, an automatic one-game suspension is issued by the league. Beverley and the Clippers aren’t expected to advance past the opening round, but they have already done their part in creating an uncomfortable circumstance of which the field might be able to take advantage. Durant appeared to relish the banter as he flashed a massive smile during the fourth-quarter incident, and it remained plastered on his face while he slapped high-fives with fans on his way to the locker room. Beverley was a nuisance all evening as he pushed, held, leaned and backed into Durant while denying him the ball. Durant routinely alerted the officials of Beverley’s tactics. The 6-foot-2 defensive wizard even mimicked Durant at one point in accusing him of drawing soft fouls. All that horseplay is what led to the fourth-quarter exchange, which Durant didn’t feel warranted an ejection. “The previous play, I got fouled on the layup and Pat came out of nowhere and blocked it,” Durant said. “It was just — not friendly, but just trash talk, you know, and it's an emotional play for him, so he's going to show his intensity after that play, and I respected it, and I'm sure everybody on the court did. But it was the same play for me coming back on the other end, where I had an opportunity to kind of bring some intensity to the arena, to the game, to my team, and I thought that was a perfect time for me to do so, without resulting in a technical foul. Despite the constant bickering by the two, Durant said he enjoyed the interactions. But the Warriors are concerned, sources told Yahoo Sports, and recent history hasn’t been too kind to them. In a similar situation, Draymond Green earned a one-game suspension in Game 5 of the 2016 NBA Finals against the Cleveland Cavaliers after the forward picked up his fourth flagrant foul of the postseason. Golden State would go on to blow a 3-1 series lead and fall to the Cavs. The Warriors might have won Saturday, but Beverley might have helped give the field an edge in the near future.